Illustrated to the right is Lactarius deliciosus--a phylogenetically, morphologically, and ecologically distinct European species that does not occur in North America, characterized by mycorrhizal association with pines (species of Pinus), conspicuous pot-holes on the stem surface, and thin-lined sporal ornamentation. I have seen Lactarius deliciosus in European woods and in markets, but I have not collected it for study. Over the last decade or so Belgian mycologist Jorinde Nuytinck and collaborators have published a series of papers (2005, 2006, 2007a, 2007b, 2007c) investigating the area of the genus Lactarius to which Lactarius deliciosus belongs: section Deliciosi. Nuytinck studied the DNA (ITS and gpd genes) of specimens from across the globe, and was able to provide a fairly detailed accounting of the section, especially in Europe, where the true Lactarius deliciosus has several look-alikes, including Lactarius deterrimus, Lactarius fennoscandicus, and Lactarius quieticolor; see Nuytinck's key to European Deliciosi for details. As for the North American mushrooms in section Deliciosi, most of our traditionally recognized species were well supported by Nuytinck's DNA results--including, among others, Lactarius indigo, Lactarius subpurpureus, and Lactarius thyinos. However, the picture was not so clear when attention was turned towards the various mushrooms traditionally called "Lactarius deliciosus" in North America. They certainly weren't Lactarius deliciosus: "Intercontinental conspecificity in this section seems much lower than assumed so far. No overlap could be shown between America and Eurasia" (2007a, p. 829). Nuytinck and collaborators felt that the deliciosus-like taxa in North America "remain problematic" (2006, p. 262) and decided "not to draw any further taxonomical conclusions and consequently not to propose any new names" (p. 297). Lactarius deliciosus var. deliciosus. Pleuromacrocystidia absent; cut surfaces not staining dark red; not occurring in North America according to Hesler and Smith, but occurring in California according to Methven. The name is now misapplied (see above), but the mushroom described by Methven obviously exists, and was apparently not included in Nuytinck's analyses; the only California deliciosus group specimen included was labeled "Lactarius deliciosus var. deterrimus" (unaccountably, since neither Methven nor Hesler and Smith describe this variety for western material). Lactarius deliciosus var. areolatus. Pleuromacrocystidia absent; cut surfaces staining slowly dark red; spores 8.5-12 X 6-8.5 µ; common in western mountains from Alaska to Oregon and New Mexico but not occurring in eastern North America according to Hesler and Smith; occurring in California according to Methven. Specimens identified as Lactarius deliciosus var. areolatus formed a well supported, distinct clade in Nuytinck's analyses. Although this mushroom is not a variety of Lactarius deliciosus and cannot be named "Lactarius areolatus" since a species with that name already exists, it is clearly demarcated morphologically, ecologically, geographically, and phylogenetically (see the linked page for a description, illustrations, and discussion). Lactarius deliciosus var. piceus. Pleuromacrocystidia present; cut surfaces staining dark red; occurring under spruce in Europe and in western North America according to Hesler and Smith; occurring in California according to Methven. No specimens identified as Lactarius deliciosus var. piceus were included in Nuytinck's analyses. 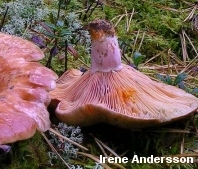 Although Nutinck and collaborators point out that the taxon name is problematic ("Lactarius piceus" was invalidly described in 1947 by Smotlacha since he neglected to include a Latin diagnosis--and, anyway, the mushroom he described has been reduced to synonymy with Lactarius deterrimus), the mushroom described by Hesler & Smith and by Methven awaits molecular study. Lactarius deliciosus var. olivaceosordidus. Pleuromacrocystidia present; cut surfaces not staining dark red; occurring under sitka spruce in northwestern North America according to Hesler and Smith; occurring in California under sitka spruce according to Methven. Nuytinck's analyses included two specimens bearing this taxon name, but they did not appear to group together as clearly separate from Wyoming and California specimens (mis)labeled Lactarius deliciosus var. deterrimus. REFERENCES: Lactarius deliciosus: (Linnaeus, 1753) Gray, 1821. (Fries, 1821; Saccardo, 1887; Heilmann-Clausen et al., 1998; Nuytinck & Verbeken, 2005; Nuytinck et al., 2006; Nuytinck et al., 2007a; Nuytinck et al., 2007b; Nuytinck et al., 2007c.) North American taxa: Hesler & Smith, 1979; Methven, 1997; Nuytinck et al., 2006.